Did Panasonic Inadvertently Leak The Canon EOS 7D Replacement Specs? Thanks Alan for the link. 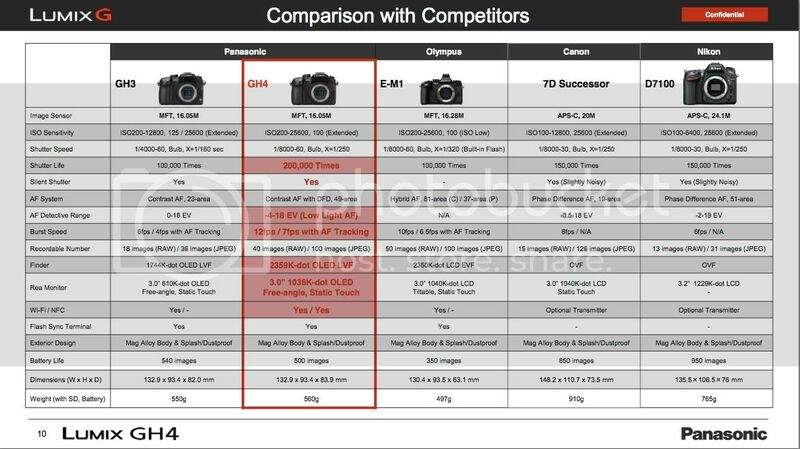 The crop above is taken from a slide of Panasonic’s presentation of the GH4, and shows some (supposed) specs for the EOS 7D replacement. I previously reported about that. The whole presentation found its way to the web, and to the forums of Personal View as a downloadable PDF. Hard to believe that the specs shown at Panasonic’s presentation have something to do with Canon’s next APS-C flagship. And it is hard to make predictions for the EOS 7D replacement, which should be announced around Q3 2014. Is This The Canon EOS 7D Replacement? Two New EOS M Cameras Before End Of Year?